There are several studies which suggest that about 50 percent of energy is wasted every year in commercial buildings due to inefficient use. Over-cooling and hotspots impact employee productivity by 8-10 percent. While many companies are investing towards ensuring energy efficiency and improved operations, 75F has been leading the way. The startup has been providing dynamic solutions to help bring down energy costs and providing an overall employee comfort — all with the aid of internet of things (IoT) and machine learning. The company’s intuitive, self-learning system optimises comfort, increases energy efficiency and provides insights into how a commercial building uses its energy efficiently. Short for 75 Fahrenheit, 75F was founded in 2012 with headquarters in Minneapolis, US. Analytics India Magazine got in touch with Gaurav Burman, VP and Country President, which has had a presence since August 2016 in India. It has witnessed a remarkable growth, having added customers such as Firstsource Solutions, Flipkart India, Bennett-Coleman Group, HCL, Mercedes Benz, Mapletree and many more. In this detailed interaction he talks about how 75F harnesses the computing power of cloud and packs it into smart commercial building, use of ML to deliver fast functionality, growth plans in India and more. “We are at an exciting space right now and there is a lot of interest in building tech capabilities and intelligent buildings. To meet these needs we are building a platform based on IoT, cloud computing and machine learning that ensures energy efficiency”, says Burman. The platform has been largely deployed into the mainstream levels. Burman believes that in India especially it comes at the right time as there has been an increasing focus on energy efficiency in the country, which will be rightly provided by their platform. “It has the potential to enhance comfort and improve the employee experience”, he said. 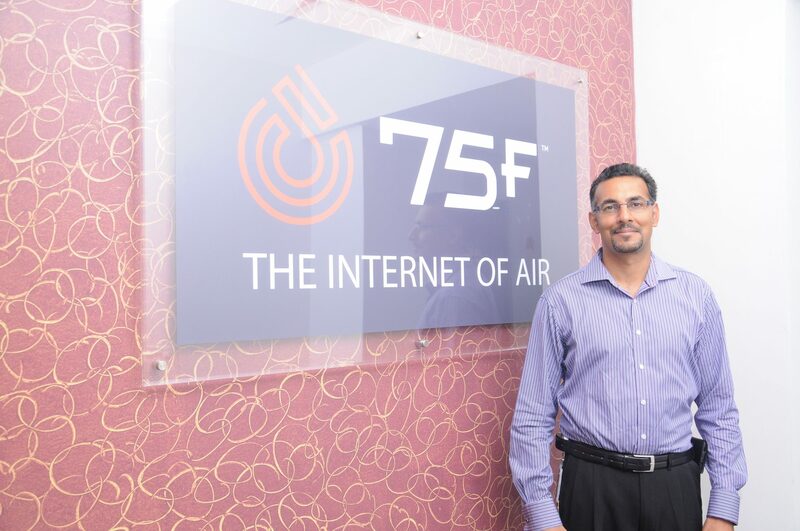 75F is removing the barriers to building automation. As traditional building controls systems are overbuilt and require extensive resources to install, setup and maintain the system, requiring high costs, 75F offers a quick and easy-to-deploy solution. Born in the cloud, 75F offers data-driven, proactive system management and software-defined configuration for a range of applications, with no programming required. The intelligent building solutions offer automated systems with web and mobile control benefits for Commercial Real Estate CRE owners and asset managers, property managers and facility management professionals, energy managers, design engineers, mechanical contractors and tenants, down to the individual occupant – the ultimate customer. “IoT allows us to make sure that there is a lot more weightage and intelligence to the solutions that we offer”, says Burman. He further shares that all the sensors and controllers that are installed where people sit, are all interconnected with the local cabling. The benefit here is that the end customers do not need to invest heavily in terms of routers and that networking can be done more efficiently. “It also allows us to do quick retrofit kind of installations. There are also other benefits in terms of wealth of information, benefits to customers in terms of visibility, greater comfort, and more importantly in energy saving”, he added. With regards to machine learning, it helps in numerous processes such as learning about occupant status, where people are and at what time in the building. ML allows for a more efficient management of resources at our disposal, such as searching water, coolant or lighting. “With machine learning, we are able to manage the spaces better and deliver a greater employee experience, while enhancing the operational efficiency”, shares Burman. He further adds that at the backend, with regard to the equipments that they control, machine learning is still a work in progress but are headed towards a using it for a better understanding of what goes inside the equipment and also enhance the usefulness of the equipment. Burman believes that it is this significant use of IoT and machine learning, which differentiates their solutions from others in the market. The technology team at 75F use various machine learning and analytical tools apart from making use of big data analytics, embedded machine learning, cloud computing and enhanced intelligent algorithms. With two-and-a-half years of establishing a facility in India to adding new people to the team, 75F has witnessed significant growth. “Today we have about 45 people, of which 25 are into engineering, tech support, sales and marketing, finance, HR and various other functions”, shares Burman. The company currently have offices in Bengaluru and Mumbai, which is important stations for carrying out research and innovations. Apart from it, they also have partners in Singapore and middle east, through which they work on various projects across the world. Burman shares that in terms of growth and expansion, there has been a considerable increase in customer base and clients. Their immediate focus is on getting repeat businesses from them, apart from adding new clients. “It has been an interesting journey and we have been quite encouraged. We have experienced triple digit growth rate and are looking to expand marketing capabilities, and doing better job than what we have done in the past. We aim to make our customers happy,” added Burman. The first challenge is customer mindset, shares Burman. “Over the years they have been attuned to following certain pattern. Most of the times we have to make them unlearn a lot of things that they are traditionally used to. They usually have established practices. We have to do pilots and train them into our systems. We have to make them trust the system, which is the biggest bottleneck we face”, he said. The second challenge is the willingness of customers to put their money on the table. “We have to demonstrate the benefits that we offer in terms of efficiency, comfort and better visibility. Customers seem to be hesitant in terms of how comfort can be measured. Asking customers to invest their money is an ongoing effort and as we reach out to more and more clients, the market start accepting it as the new normal”, he said. “We see it as growth vector, as growth map would mean growing only in one direction. We are targeting success in various directions. Roadmap in terms of customer segment vertical is to grow in various areas such as automotive, commercial, real estate and hospitality. In terms of geography, we plan to expand in countries such as Australia. Currently we have lot of new products planned, new platform planned, and we look forward to delivering better services to our existing clients”, he said on a concluding note.